In 2011, I wrote an article about how the banjo, which was once used in all kinds of American popular music, has now been marginalized, largely due to the general public's association of the thing with Hee Haw and Deliverance. Well, since then, I've learned that there's one kind of banjo that gets no respect, even from banjo players - the six-string banjo. Yes, I've seen the ads from off-brand importers guaranteeing that their unplayable wall decorations will turn any third-rate guitarist into a "real" banjo player overnight. I've also seen the Craig's list ads from folks who swallowed that malarky and are tired of embarrasing themselves with the thing. I've also heard it called demeaning names like "Gitjo" and Banjitar" by people who believe that 6-string banjos are nothing more than "crutches" for lazy guitar players wanting to get a banjo sound. But the truth is that the six-string banjo was invented over a century ago, when the most popular fretted instrument in the U.S. was the mandolin, and the Jazz banjo was on the verge of replacing it. The guitar was not even "in the picture" (so there was no question of the 6-string banjo being invented for lazy guitar players). Actually, two kinds of six-string banjo were invented, although only one is still being commercially manufactured today. Zither 6-String Banjos - Some of the first six-string banjos were based on traditional 5-string banjo design. That is they kept the drone string but added a bass string between it and the fourth string (the lowest-pitched string on a 5-string). That allowed them to hit notes as low as G or F, depending on the tuning, giving them almost the range of a guitar. These were a bit more common in Europe, where "Zither Banjo" players played gut-string banjos in styles similar to classical guitars. On most of these, the drone string went all the way to tuners on the head, but it went through a sort of tunnel and didn't emerge until the fifth fret, so the banjo was played like a five-string. Here's an irony - many zither banjos were made by guitar manufacturers using the same peg-heads they used for their guitars. So, like the Temlett/Kranz banjo above right, many of these banjos have a dummy sixth peg, to keep the banjo's head looking symmetrical. So a lot of old photos that look like they're showing 6-string banjos are really showing 5-string zither banjos. 6-string zither banjos built in the U.S. by banjo manufacturers often look more like traditional 5-string banjos, but there is an extra peg sticking out of the middle of the peg head. The fifth string may or may not be tunneled. A number of the six-string banjos with drone strings have survived to this day, and a few 5-string pickers have had similar banjos custom-built to use for picking styles associated with traditional American music. Owners of these instruments like to call them "Six String Banjos," which is fine. However, they like to call the far more common droneless six string banjos "Banjitars" or "guitjos" or other silly nicknames. I think they're trying to establish who the real six-string banjo players are and who are the fakers. As a 5-string banjo player who can also play all three kinds of 4-string banjo, and both kinds of 6-string banjos, I don't consider myself a faker on any of those instruments, and I don't automatically assume that anyone else is either. Jazz-Inspired Banjos - While zither banjos (mostly 5-string) were becoming popular in Europe, Jazz and Jazz-inspired banjo playing was breaking all records in the United States. This includes what we might call "legacy" or "ragtime" today. It also included Tin-Pan Alley imitations of that jazz, often called Dixieland. 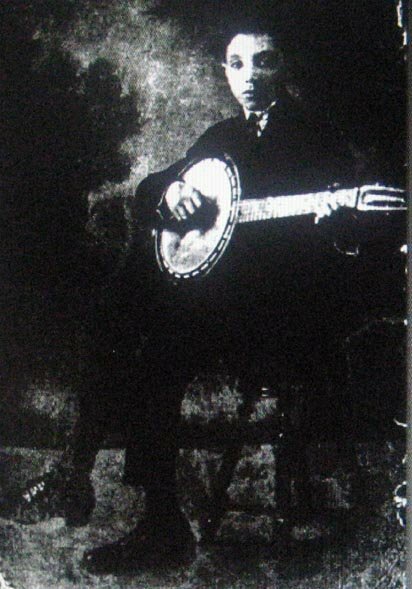 By 1920 the banjo was as integral to popular music as the guitar is to rock-and-roll. In fact, it took on a life of its own. 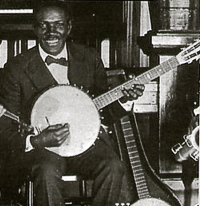 Communities, fire departments, and boarding schools started all-banjo orchestras. Manufacturers responded with a wide range of banjos, including some that were much smaller and some that were much, much bigger than any banjos being made today. And, yes, they experimented with different tunings and different numbers of strings. One of those experiments was a "droneless" 6-string banjo. Like the 4-string Jazz banjo, it abandoned the drone string because jazz banjo chords often had to be stacatto and in weird keys - a single note ringing on and on did not suit. But, depending on how it is tuned, a six-string jazz banjo can go nearly an octave below most other banjos. Consequently, it can produce a range that is compelling and unique, while still providing an overall tonality that is all banjo. Some sources claim that the influential Jazz guitarist Jean "Django" Reinhardt started out on one. Unfortunately, it's hard to tell what kind of banjo he's holding in the earliest surving photo (right). It could be a droneless 6-string, or a zither banjo with either five or six strings (remember what I said about the fake pegs and tunneled drone string?). According to Diana Hergert, of California's Sweet Tidings Gospel Jam Band, Johnny St. Cyr's 6-string banjo appears on early jazz recordings of King Oliver's Creole Jazz Band (which at that time also included Louis Armstrong.) Oddly, St. Cyr often used his 6-string to provide bass lines, something you can't do on a 4- or 5-string. In other research, I came across enough information early Jazz banjo players to convince me that the vast majority of 6-string banjos before 2000 were used, not for Folk, Country, or Bluegrass, but for early Jazz and for acts that pay tribute to early Jazz. In other words, in the Jazz world, the 6-string banjo has been an acceptable alternative to the 4-string (plectrum) for at least ninety years. And lets face it, few folks have ever accused Jazz musicians of choosing an instrument because it was "easy." Apparently Jazz musicians - unlike players in other genres - listen to the output rather than counting tuning pegs. Neglected by the Folk Revival? Like the 4-string Jazz banjo and its mate the Tenor Guitar, 6-string banjo seems to have been almost entirely overlooked by the Folk Revival movement, which might have made good use of it. But, of course that movement was largely sparked by Pete Seeger, a 5-string banjo player who helped bring that instrument into the mainstream in the mid-20th century. Ironically, Pete's banjo techniques have largely been displaced by those inspired by Earl Scruggs. So the instrument Seeger put on the radio all over the country is now associated almost exclusively with Bluegrass in the public consciousness. See our article Whatever Happened to the Banjo" for more comments on that phenomenon. The 4-string banjo did make an occasional appearance. In fact one version - the low-pitched Irish tenor banjo - became a staple of Irish Folk music. Ragtime is History; What's Left? Nowadays, Ragtime, Dixieland and other forms of early Jazz are performed only by tribute groups. Even the 4-string banjo is nowhere nearly as common as it once was. That has left 6-string banjo manufacturers one remaining market to tap - the genres usually associated with 5-string banjo, which, frankly, a 6-string does not imitate all that well. Still, the 6-string banjo is now being marketed almost exclusively as a way for guitar players to instantly "learn banjo." And - let's face it - by "banjo," the manufacturers really mean Bluegrass banjo - currently the most popular style, and the style hardest to play on a 6-string. At least one maker whose manufacturing philosophy is "slap a cheap guitar neck on a cheap banjo pot (body) and throw it in the box," has flooded the Internet with an announcement to the effect that there is "no need to learn a new instrument." According to their hype, you can just order one of their products and, presto! you're a banjo player. Well, no, you're not. Since I started this article, I've come across several nationally-distributed Orient-manufactured brands whose $150-300 products are useless for most, if not all, the kinds of music discussed on this page. As you'll see later in the article, although you can get a sound out of certain properly set-up inexpensive 6-strings, certain kinds of music demand a well-made instrument. Moreover, if you buy an under-$600 banjo of any kind, and you have no one to set it up for you, you'll be lucky to get anything out of it at all. Since I wrote this article, I have experimented with four more six-string banjos. A Rogue, which I thought might make a good backless or beach banjo, a Dean Electric/Acoustic Backwoods 6, which is shares only the neck with its "pop-top" brother (for an article comparing the two, click here), an abused Deering D-6 that I got cheap and nursed back to health, and a Davison (Jameson) 6-string that I replaced the bridge and nut on, made very playable, and am currently using as a travel guitar. The Rogue and my first Dean Backwoods 6 ("pop-top") model have now been sold to make room for the upgrade models. With its back off, the Rogue was fine for strumming with a flatpick, but its strings were too close together to fingerpick, even with a replacement bridge that the Dean people were nice enough to give me to try out on the thing. The "pop-top" Backwoods Six just rings too much for the kind of music I want to use it for. Ironically, the more expensive electric/acoustic version, with a wooden pot and no tone ring works better for me acoustically than the "pop-top," because it has less sustain. I can see why folks who have tried off-brand or "entry-level" six-string banjos think they are "jokes," or don't deliver on their manufacturer's promises. I can even see why folks who've tried intermediate six-string banjos have been disappointed about the adjustments in playing styles that the things force them to make (or at least consider). But I can't see how any decent fingerpicker who's ever tried a Deering B-6 or D-6 could claim that it's anything but a SERIOUS banjo. Yes, there are intermediate models I haven't tried, that some folks like. I list some of the ones I would expect to be playable on our Buyer's Guide. The fellow I bought my first 6-string from knew nothing about banjos, so he didn't realized that the "big box" store he had bought it from had never "set it up." (I doubt he would have stuck with it anyway, based on the fact that when he brought it to a Bluegrass practice session, his bandmates threatened to kick him out of the band if he didn't take it back to the car immediately - way to show the love, guys!) I spent a couple hours tightening the head, adjusting the neck, replacing the strings, and resetting the bridge. Eventually, I wound up with an instrument that sounded and played 100 times better than when it had come out of the box. I also figured that when I was done with the Dixieland gig, I'd keep using it, though I'd be fingerpicking rather than strumming for the most part. For one thing, as I got more used to the instrument, I realized that this particular instrument is more useful for Folk than Dixieland, which requires better playing action on the high frets than my Backwoods Six provides (more later). Then I set to learning some Dixieland banjo strumming techniques, and practicing lots of barre and diminished chords. But in the meantime, I've had to explain my 6-string banjo to more than one person who assumed that I was only playing it because I was too lazy to learn "real" banjo. Before long I had collected enough information to justify another article (this one). Of course that meant even more research. The more I played the thing and the more I learned about its history, the more I realized that the 6 string banjo is an instrument in its own right. It is certainly not - as as been widely advertised - a way for guitar players to "learn the banjo" without actually learning anything. Yes I've seen the videos of a certain Country star using a flatpick to strum open-string chords on one - something that sounds bad on most banjos most of the time. The best thing about those videos is that the resulting cacophony is mostly drowned in the mix. But I've also seen Keith Urban and a number of local friends play the thing intelligently, picking complex leads and arpeggios with compelling results. If you're used to strumming your guitar with a flatpick, know that using a flatpick to strum open (root position) chords on any banjo will sound cacophonic, because some of the notes will ring louder and longer than you're used to - even after you've changed chords or deadened the strings! Strumming with a pattern that hits just the high strings can give you something like a Dixieland sound, but that's not why most folks buy these things today. The best uses of a flatpick with a 6-string banjo usually involve picking individual notes, such as leads and arpeggios. If you do use any strumming at all, it has to be much lighter than any picking you do - a hard adjustment for some folks to make. Flatpicked single-note leads, the kind you're used to hearing Bluegrass or Country players do on their dreadnoughts, sound great. The "chimey" lower notes especially are reminiscent of a flatpicked Dobro, creating sounds that a person interested in traditional American music can really "get his teeth into." It is possible to use a pattern where you hit a base note on one (and maybe a hammer-on or pull-off on one-and one-half), followed by a light strum on two and an even lighter up-strum on two-and-a-half. But know it will sound like a sort of "plantation" banjo - a cross between folk and Dixieland. You've heard the sound on the opening tune of the original Muppet movie. The interesting part of this sound is that the bass notes are way lower than most "bass notes" on a banjo, so Bluegrass AND Dixieland musicians will instantly recognize that you're outside the realm of the banjo parts they're used to hearing. That is not necessarily a bad thing. In fact, in the orchestra, I have added walking bass to a few songs - something that St. Cyr used to do - and it sounds quite in line with King Oliver's old sound. I'm sure other patterns have developed or will develop, but as a rule, avoid patterns that have you strumming multiple open strings at the same time at full volume. Again, this is a problem on all banjos, not just 6-strings. You just hear it more often on 6-strings because guitar players who don't really know what a banjo is supposed to sound like have bought into the "you play it just like a guitar" hype. Fingerpicked, a 6-string banjo has less sustain than guitar, so patterns that depend on notes carrying over for more than a half a beat tend to sound weak. "Hammering on" and "pulling off" require more effort on the 6-string banjo than they do on guitar. When you "hammer on" - fretting a string after it's been plucked, you can't count on the string continuing to ring like it does on your guitar. So you need to "whang" it relatively hard. Overtones require a lot more precision. Pick a base note with your thumb (beat 1). Hammer on or pull off if you can (beat 1 1/2 - optional). With the back of the fingernail on your middle finger, use a "flicking" motion to downstrum across the top two or three strings (beat 2). Pick the first string or third string, whichever is easier for you. (beat 2 1/2). This pattern imitates a common 5-string banjo pattern, replacing the drone (5th) string that usually hits on beat 2 1/2 with the first or third string. Yes that note is lower and won't ring as long as the drone string on a 5-string, but will fill the time slot nicely and give the general effect. Unless you're a music historian or fan of early Jazz, most of the songs you hear with Dixieland banjo today are actually Dixieland-style Tin Pan Alley compositions like "Has Anybody Seen my Gal" or "Alexander's Ragtime Band." The banjo parts for those songs tend to be pre-written and highly formalized. Yes, Dixieland and Dixieland banjo are "bigger than that." But if you're asked to bring a banjo to a strict "Dixieland" gig, chances are you'll be expected to play within certain conventions that have been established since the "Roaring Twenties." Conventional Dixieland banjo players typically use the full length of the fretboard, usually with few or no open strings, similar to the way a Jazz guitarist might. In the right hand, they hold a flatpick that they strum up-and-down across all four strings of their instrument very fast, rotating the right wrist instead of bouncing the right hand up and down. How does a guitar player make that and related adjustments? Plan on Moving Up the Neck - Now that I've done this for a few weeks, I realize that, instead of using barre chords only when I had to, I would be getting a more authentic Dixieland sound if I had gotten used to barre chords all the time, and using chords at the fourth fret or higher. When the song was in C, for example, I was playing C open or at the third fret, playing F at the first fret, and so on. But the more I have gotten to know the music, the more I have realized that I should be playing C and F at the eighth fret, and so on. If I'd gotten used to that from the start, I would be playing more authentic parts, and it wouldn't be so hard to emphasize the higher strings over the lower ones. As an aside to this point, I realized that this is one place where the value of a $1200 6-string over a $400 6-string would be most obvious. No matter how I tweak it, the action on my Dean Backwoods 6 is not all that conducive to playing barre chords between the 7th and 12th fret. The action is just a tad high - but when I tried to lower it any further, I started getting fret buzz, enough places to indicate that this banjo would need serious work if I ever wanted to play "faux Dixieland" on a regular basis. So it is what it is. Ironically, this isn't a problem when I play the thing as a Folk instrument, since I play open chords as much as possible, usually in root position or below the 6th fret at any rate. But if I was to get a paying gig as a Dixieland player (not likely), I would definitely have to start looking at Deering or GoldTone versions. Keeping That Four-String Sound - Rotating your wrist to strum up and down quickly gives you enough motion to strum 4 strings up and down very fast - about as fast as a Venetian mandolin player plucks melody lines. Unfortunately, wrist rotation doesn't give most players enough range of motion to play six strings very fast this way. Also, if you have any low-pitched instruments in the ensemble, the low strings will just muddy the mix. Consequently, if you really want to use a 6-string banjo to play Dixieland, or related styles, you will want to practice hitting just the top four strings. This is tough, I grant you, and you will still need to fret or deaden the lowest two strings, because otherwise they will ring, even if you don't hit them. That said, if you get used to playing most or all barre chords (even for keys like D that are much easier to play "open"), that's not a problem. Alternatively, some guitar players who buy 6-string banjos exclusively for Dixieland have replaced the 5th (A) and 6th (Low E) strings with lighter strings that they tune an octave or two higher. They play the full barre chords with their left hands, but if they inadvertently hit the 5th or 6th strings, it doesn't muddy the sound. Changing Chords Quickly - Here's another consideration - because Dixieland is typically played on a 4-string (which theoretically should have easier chord changes), some Dixieland-style arrangments have chord changes nearly every beat - something that may be hard to do with barred guitar chords if you're playing in horn-friendly keys (more flats than sharps). You may find yourself inventing fingerings that deaden, rather than fret, the lower strings just so you can keep up. If you're used to using the back of your middle finger to strum down across the lighter strings, there's no reason you can't keep that up, though. Finally, if you want to get something like the effect of the drone string hitting on the second half of the second beat, try picking either the first or third string (depending on which finger of your right hand you find easier to use for this). On the 5-string you're used to playing either a melody or bass note on the first half of the first beat. As you adjust, you may find it easy to play both - the way classical players do. This will open up a number of possibilities for experimentation. 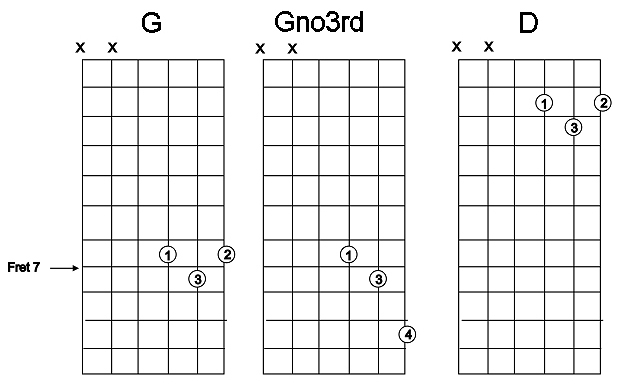 You may also find the tips about "Folk-Style Fingerpicking a 6-String Banjo" (above) helpful. This takes the 6-string back to its roots. In addition, many blues patterns sound great on a six-string (it's possible that a few well-known traditional acoustic blues guitarists used to double on 6-string banjo). If you're a solo acoustic blues or jazz performer (or playing in an ensemble that is flexible about its arrangements), you may find that adding the low strings makes the music sound more "gutsy" (not unlike the low strings on an acoustic Dobro). To me, "bluesy" songs like "Nobody Knows You When You're Down and Out" were all but written for 6-string banjo. And if you can't make "Brother Can You Spare a Dime" work on a 6-string, you're not trying. The one thing that will stifle experimentation on a 6-string banjo is attempting to make everything you know about 5-string banjo OR guitar apply. It's a different instrument, one that was originally custom-made for what we now call "roots music." Let it "out of the box." Although the banjo is, for all intents and purposes an "American" instrument, one version of the 4-string banjo has been popular among Celtic bands and occasionally among Skiffle bands (the UK parallel to the US Folk Revival movement) - the Irish tenor banjo. Irish tenor banjo is usually tuned in fifths, often using a tuning (E ADG) which is an octave below a mandolin. This makes the instrument relatively easy for mandolin players to double on. But more importantly, It gives the low-pitch Irish tenor a range that approaches that of a 6-string banjo. In addition to a similar range, traditional Irish tenor banjo usually plays melody, a note at a time, although picked arpeggios are becoming much more common in modern Celtic-inspired music. Both of these methods sound great on any 6-string banjo. I've seen guitar players who joined North America Celtic bands play very convincing Celtic parts on 6-string banjo. I've also seen Irish-born 5-string players double on 6-string banjo for some songs. If they can do it, you can do it. Ironically, this article has brought me full circle, back to the time I played guitar in the pit orchestra for Flower Drum Song, some 42 years ago. I borrowed an antique Gibson electric to get the appropriate electric sound, but the part also required a few measures of banjo here and there. In this case, the banjo part was flatpicked, one note at a time, to imitate an oriental instrument (maybe the kyoto?). I brought in my 5-string and easily played that part. But for a guitar-player who did not play banjo at all, the part would be just as effective on a 4-string or 6-string. As far as I can tell, most musical theatre scores where the guitar player doubles on banjo assume a 4-string, so they could be performed credibly on a 6-string. Of course this isn't true for any musicals that actually require 5-string banjo (Smoke on the Mountain comes to mind). When The Boy Friend premiered in London in the 1950s, there was presumably a 4-string banjo in the orchestra. However, when the same play crossed the Atlantic, a 6-string banjo was used. Having worked the thing out, in time for the performance, I believe that either instrument will work fine if played intelligently. As an aside, we produced The Boy Friend in a 700-seat auditorium that seldom had more than 500 seats filled. To me, the thing was loud enough unamplified - I certainly could hold my own with the trumpets and drums except when they got very loud. But the director wanted to hear the banjo even during the very loud parts. So I did break down and buy an inexpensive piezoelectric pickup for the thing and run it through a combo amp. It worked fine, but I wound up keeping the amp's volume pretty low, so it supplemented the sound more than replaced it. For details on the pickup choices I faced, and what I wound up doing, please see our article "Banjo Pickups." As I mentioned above, after my experience on "The Boy Friend" I tried a Rogue 6-string banjo with a wooden pot, no tone ring, and not much sustain. Without the resonator, the thing could be strummed with a flatpick without creating the deafening, muddy sound that I had to be careful to avoid with my aluminum-pot banjo. So if you're a jazz guitar player who's been asked to double on banjo for a faux-Dixieland musical like The Boy Friend or Thoroughly Modern Millie, consider a backless 6-string. First of all, let me tell you the best use for the cheapo, orient-made off-brand 6-string banjos that are now being advertised as the way to "play banjo without learning anything." The resonator, which comes off easily, can be cleaned out and sealed with clear acrylic spray to make a nice serving dish for snacks. The rest of the thing would make a good backup canoe paddle. Yes, if you are a determined musician, you can learn to get at least a few useful sounds out of it, but you're a determined musician, you can probably get a useful sound out of a brick. As I've reported above, my Dean poptop and my Rogue cheapie were useful for certain kinds of music, but I've tried several cheaper brands that aren't good for anything. And if you don't have someone who can set them up for you, don't even bother getting them out of the box. That said, if you can get a well-made 6-string banjo, or you can get an intermediate model set up properly, it can be used credibly for a wide variety of music. Note: The following table is based mostly on my own experience and research. If you have been pushing the envelope on this thing, then I am actually looking forward to you proving me wrong. Just let me know what you'd change or add. I'll also send you instructions for how to send me sound samples if you'd like. Early Jazz (Ragtime, Dixieland, etc.) As much as possible, use barre chords high up the neck. If you have low-pitched instruments in the band, consider avoiding or muffling strings 5 and 6 for to avoid muddying the overall sound. This is the most authentic traditional use for the 6-string banjo. Folk, Skiffle, or World Music Fingerpicking or flatpicking single notes. Avoid strumming open-string chords unless you need ear-splitting volumes - or you have an open-backed, no-tone-ring banjo. Sounds plenty "folksy" and adds a nice additional texture. Also can convincingly play any of the (relatively few) 4-string banjo parts that were used in Folk Revival or Skiffle. Celtic Traditional Irish banjo usually involved picking the melody with a flatpick for the most part. Playing arpeggios has become common in modern Irish banjo - you can flatpick or fingerpick as you wish to get the sound you need. Avoid strumming open-string chords unless you have an open-backed, no-tone-ring banjo. It still won't sound entirely authentic, but at least it won't make the sound of your ensemble muddy and unbalanced. Those fiddle tunes can be pretty tough, and you'll need to know about a thousand of them to have credibility, so don't assume you'll master "Irish banjo" sounds overnight. Country Fingerpicking or flatpicking single notes. Strumming it the same way you would your dreadnought will muddy the mix. Adds a nice "old-timey" texture, though if you forget yourself and start strumming, folks will start thinking "Dixieland," not "Dixie Chicks." Blues or Jazz Still useful, as long as you choose an appropriate style for the song you're playing. It takes practice, but may be worth it for you, especially if you're called on to play an acoustic or period gig. I'm thinking Leon Redbone could have made this puppy sing. Musical Theatre Useful for guitar players whose parts ask them to double on banjo briefly. Examine the score to make certain it calls for chords or individual notes - most of them do. If it calls for real 5-string playing, a 6-string will probably not do the job. Bluegrass Fingerpicking or flatpicking single notes. The lower, metallic tones have some of the same gutsy plunk as a flatpicked Dobro. Wear a helmet and bulletproof vest the first time you bring this to practice. Explain to the 5-string player that you're not trying to take over his/her job, that your Dobro is in the shop. Eventually he'll/she'll realize that your sound complements the 5-string rather than competing. Ironically, when I was doing my research, I discovered that some of the best 6-string banjo players today are the first to apologize for playing something that is not a "real banjo." In fact, one company that considers itself a serious banjo manufacturer is very careful to list their 6-string banjos as "banjitars." I guess they're afraid of losing "cred" if they call them banjos, as Deering does. Yet, in EVERY instance of real-world use I came across, the thing was being used to play banjo parts and produce banjo sounds - even if the effect isn't always completely, er, effective. Not ONCE did I come aross an example where the thing was being used as a guitar (or as any other instrument). So constantly explaining that "It's really a guitar" or some such is misleading at best, and it insults both the instrument and the player. Making up cutsey new names (like "gitjo" or "banjitar") for this century-old traditional Jazz instrument is just plain silly. So what is it about this instrument that makes people claim that it's not a "real" banjo? The number of strings? Not only does that seem arbitrary, a few banjos with drone strings have added a lower string - bringing the total to six. Even five-string diehards call those banjos. The lack of a drone string? But that's traditional on all Jazz banjos. The tuning? Don't even think about it. 4-string banjos have - count them - 4 common tunings. 5-string banjos have at least three that traditional pickers use all the time, and about eight that are used for specific traditional or Bluegrass tunes. No one claims that retuning your second, fourth, or fifth string keeps it from being a banjo. That it shares tuning with another popular instrument? The low-pitch Irish tenor banjo shares its tuning with the octave mandolin, but nobody calls it a "manjo." In fact the once-popular Tenor Guitar originally adopted its tuning from the Jazz Tenor Banjo and no one has ever claimed that it is "really" a banjo. The fact that ignorant wannabes believe the claim that $200 wall decorations will turn them into real banjo players and wind up making a lot of noise on them? Well, that would disqualify pretty much "starter instruments" of every kind from being "real instruments." In other words, when anyone with a good ear and an understanding of their own genre learns how to play a 6-string banjo, it looks like a banjo, it plays like a banjo, and it sounds like a banjo. If it a banjo was a kind of animal, it would walk like a banjo. Nuff said? Since I wrote this article I've notice that both 6-string and 5-string banjo are experiencing revivals in Country music, something I'm very glad to see and hope will spill over into other genres again. Country musicians who play 6-string banjos seem to be calling them "banjos." To me, I hope that means that they recognize that they are something other than crutches for guitar players who are too lazy to learn another instrument. If you're still not convinced, walk up to Keith Urban the next time you see him and accuse him of playing his Deering 6-string banjo because he's too lazy to learn "real banjo." That is if you have a good dental plan. I've also started a series of "Buyers' Guides" for folk and traditional instruments. No, we don't sell them, we just provide general guidelines and descriptions of instruments worth considering from the low to the high end of the price spectrum. We also provide links to multiple sources when possible, for our many readers who live over a hundred miles away from a decent music store. I confess that on the page for Six String Banjos, I have boycotted one manufacturer that refuses to call them "banjos." After, all, I already own what is arguably the best six string banjo ever made. Why would I lower my sites to anything its own manufacturer is embarrassed to call a banjo? Or ask my readers to? Sorry. Now that I've owned and set up four of these I recognize that just referring folks to generic articles on setting up banjos wasn't quite enough. 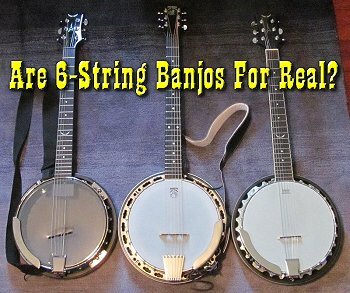 I've added an article about setting up 6-string banjos specifically. Know ahead of time that the more money you pay for your 6-string banjo the less likely it is to need major work when you get it. If nothing else, you'll need to know how to adjust the bridge. If you've already bought a cheapo - Take it to a technician to see if it's worth "setting up." If he/she says "no," and you have time to return it, return it. If it's too late to return it, have him/her do what they can with it, and do your best. Be sure to keep in mind that a "real" 6-string banjo will play easier, so anything you can accomplish with your cheapie will go that much better if you upgrade. If you've already made some progress and are getting tired of people making fun of you - Get better. Make it "yours" the way Jimmy Paige "owned" his electric, Beckham "owned" the soccer field, and Scotty Hamilton "owned" the ice. Make it work for your favorite songs. Make it work for your favorite genre. Some guitar players try to "earn respect" by buying instruments that people automatically respect, like Martin D-28s. But not everyone who owns a D-28 deserves to play it in public. Conversely there's no reason you can't earn real respect for the most despised member of a marginalized instrument family simply by making it impossible for folks to "diss" what they hear coming out of the thing. After all of these years playing and writing a dozen genres, I have to confess that, left to my own resources, I'm still mostly a Folk singer, so I'm not used to getting much respect anyway, and doubling on a 6-string banjo won't make it any worse. But there's no reason you can't take a 6-string banjo that you've really taken the time to learn into any setting, even settings where the 5-string is king. Just make sure that the sounds coming out deserve the respect you think they do. And keep in touch so we know how the 6-string banjo is faring in your part of the world. Best of luck, all, enjoy your music, and support the arts. Finally, in May, 2016, I set up a tripod and camera to record some 5-string banjo lessons, and thought I would add at least one 6-string banjo song, using a refurbished Deering D-6. This is an old prison song that Jorma of Jefferson Airplane wrote a new tune for. In the following track, I use my thumb to pick the bass strings (no thumbpick, just a big callous), and I alternate between classical-style fingerpicking and "frailing" on strings 1-3 (no fingerpicks - this thing is almost too loud to sing with anyway). Most people who go "wrong" with six-string banjos do so by strumming all six strings with a flatpick, then complaining that the low strings ringing on and on make it sound "muddy." I wanted to show that, fingepicked individually, the bass strings add a nice gutsy growl without muddying things up. Rod Stewart on Six-String Banjo - A friend just posted a link to an old MTV video showing Rod Stewart, of all people, playing a 6-string banjo on "Mandolin Wind" probably from the early to mid=1970s. At first I thought he might have a five-string, because the video is so blurry, and the location of his capo makes it look like there is a 5th string tuner sticking out. But one or two shots are clear enough to show six tuners on the banjo. Plus, if you don't count the capo, he's playing mostly D and G guitar chords. I may be reading too much into the blurry video, but the logo on the banjo could be the logo that was used on the first generation Deering D-6 (Deluxe 6-string). It also looks like there is a one-piece resonator flange, which rules out the Deering B-6 (Boston version). In addition, when this video was produced, Deering was one of two or three manufacturers who offered a 6-string banjo as a standard model. Outside of the little intro they play, the song's main intro and breaks are based on D chords played so high up the neck they are really G chords, then D chords. On the G chord, he goes between a standard D position and a version where he pops his pinky on three frets above where his ring finger is, to raise the major third note to a fifth. The chord charts show the chords he's playing reative to the capo. If you want to play the song in the key of D, that's how you play it. Otherwise strap a capo on it and go up a few steps. Once the verses start, Rod goes to back to playing a G in root position. He is still avoiding the fifth and sixth string, though. Dean Backwoods Six Shootout - a detailed comparison between the two Backwoods 6 models. My New/Old Deering Deluxe 6 - describes the purchase and rehabilitation of a somewhat abused but still very solid Deering top-of-the line six-string. Setting up a Six-String Banjo - whether your banjo needs its semi-annual tweaking, or simply arrived in unplayable condition, this article will give you specific tips you can use to make it playable (again). Also, for examples of other six-string banjos and what they "bring to the table," check out the Six-String Banjo Buyers' Guide on the new RiverboatMusic.com site. When I first published this article, I reported that the Reverend Gary Davis had been known to play one, something that another 6-string banjo fan once reported. What you probably don't know is that two blues guitarists reamed me out for making such a wild claim. And since I had trouble verifying my friend's account, I took that part back out of the article. Last year, after Deering introduced their first metal-stringed Goodtime 6-string banjo (a runaway success, by the way), they asked my permission to post excerpts from my article on their blog page. Of course I obliged. Since the article was published, several people had commented on it, but I hadn't seen their comments because they weren't being forwarded to me. Then just last week, they started coming through. So I went back to the article and saw the comments, including one from none other than Taj Mahal. Not only did he approve of what I wrote, but he also gave me the information I needed to track down at least one recording of Rev. Gary Davis playing the 6-string banjo. I have a Deering Delux 6-string banjo! I've been thrilled with it since the day it arrived at my home and I started playing it! My 1st introduction to it being played "live" was a Reverend Gary Davis concert! The Reverend played 3 or 4 tunes on the instrument! "Devil's Dream" and "Scott Joplin's "Maple Leaf Rag!" Those were the 2 tunes that I remember! Then I also bought 2 or 3 of his "holy blues" albums which also had the titles I mentioned above and others! The 6-string banjo when set up correctly makes a very versatile instrument for strumming,chording,finger-picking,rhythmic backbeats and comping with any kind of music!! Of course I googled the recordings Taj mentioned. I could only find one in my initial search, but it was enough to prove my friend's original assertion - that Reverend Gary Davis had played the 6-string banjo at least once. And done a very nice job on it, if my opinion is worth anything. Here's the YouTube link I was able to track down: "West Coast Blues." Here's another I tracked down while researching subsequent articles: "Please, Baby." Update, September 2016 - Shun the Frumious Banjitar! In late August, I was contacted by a fellow who wished to excerpt part of this article for his company's blog. I said, "Fine," but when he sent me the copy he planned to use, he had put the word "Banjitar" into the title. I wasn't happy with that, since I've been trying to get the word "Banjitar" out of people's vocabulary for years. Turns out that when people are looking for information on 6-string banjo, they use the term "banjitar" FAR more often than they use any other terms. So I let him use the term "banjitar" in the title with the caveat he was also going to put in. Then I wrote a blog about that experience stressing why cutesy nicknames like "Gitjo" and "Banjitar" are so demeaning to people who play these things. Click here to see that blog. Creek Don't Rise (tm) is Paul Race's name for his resources supporting the history and music of the North American Heartland.